Fall is insanely busy at the Ranch but we've been very photo conscious because we are applying to Big Dogs, Huge Paws to be a Foster Family. We are finally down to our home inspection which will be done initially by photographs. We all are very camera shy, each preferring to be the photographer, so we have made an effort to combat this situation, and also to sift through existing pictures to show just how animal friendly the Ranch is. So this is Spring '08, Evening chores are finished, and I hear the strangest noise upon the inside stairs - sounds that any child would expect upon the roof on a any given Christmas Eve...and up pops Freya, my favorite of the yearlings. 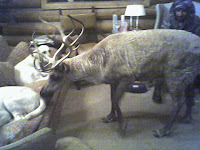 Freya used more caution with her antlers investigating then the young dawgs do when managing their wagging tails. She checked herself out in the mirrors of the armoire - Yes, I am very pretty! She warmed herself by the fire. She declined a glass of wine, she wasn't of age yet, she well knew. Freya sniffed everything with glee. She considered joining the pups on the couch, it looked pretty comfortable. But oh, she had so many stories to tell the rest of the herd now. Only she of all the reindeer had been in the big people barn! 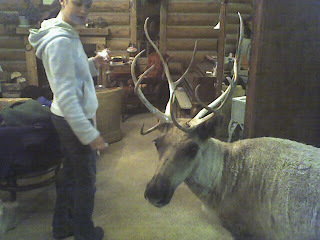 She'd dine on this for weeks, getting a larger share of beet pulp until the other reindeer grew bored with her stories of what was in the log cabin people place. Maybe they should lobby for a couch of their own? Freya took it all in again, observing well and stepping out on the the wrap around porch, she surveyed her home from up high. It was dark, but maybe the herd could hear her hooves on the porch boards. Maybe. And then she gingerly walked down the outside stairs and headed home to the South paddock to tell of the wondrous things she'd seen.